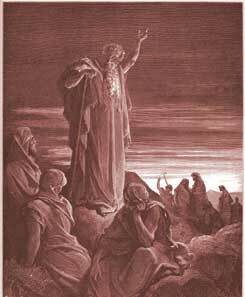 Ezekiel was one of the priests; he was carried captive to Chaldea with Jehoiachin. All his prophecies appear to have been delivered in that country, at some place north of Babylon. Their chief object appears to have been to comfort his brethren in captivity. He is directed to warn of the dreadful calamities coming upon Judea, particularly upon the false prophets, and the neighbouring nations. Also to announce the future restoration of Israel and Judah from their several dispersions, and their happy state in their latter days, under the Messiah. Much of Christ will be found in this book, especially in the conclusion.Ezekiel's vision of God, and of the angelic host. (1-14) The conduct of Divine Providence. (15-25) A revelation of the Son of man upon his heavenly throne. (26-28)1-14 It is a mercy to have the word of God brought to us, and a duty to attend to it diligently, when we are in affliction. The voice of God came in the fulness of light and power, by the Holy Spirit. These visions seem to have been sent to possess the prophet's mind with great and high thoughts of God. To strike terror upon sinners. To speak comfort to those that feared God, and humbled themselves. In ver. #4-14|, is the first part of the vision, which represents God as attended and served by a vast company of angels, who are all his messengers, his ministers, doing his commandments. This vision would impress the mind with solemn awe and fear of the Divine displeasure, yet raise expectations of blessings. The fire is surrounded with a glory. Though we cannot by searching find out God to perfection, yet we see the brightness round about it. The likeness of the living creatures came out of the midst of the fire; angels derive their being and power from God. They have the understanding of a man, and far more. A lion excels in strength and boldness. An ox excels in diligence and patience, and unwearied discharge of the work he has to do. An eagle excels in quickness and piercing sight, and in soaring high; and the angels, who excel man in all these respects, put on these appearances. The angels have wings; and whatever business God sends them upon, they lose no time. They stood straight, and firm, and steady. They had not only wings for motion, but hands for action. Many persons are quick, who are not active; they hurry about, but do nothing to purpose; they have wings, but no hands. But wherever the angels' wings carried them, they carried hands with them, to be doing what duty required. Whatever service they went about, they went every one straight forward. When we go straight, we go forward; when we serve God with one heart, we perform work. They turned not when they went. They made no mistakes; and their work needed not to be gone over again. They turned not from their business to trifle with any thing. They went whithersoever the Spirit of God would have them go. The prophet saw these living creatures by their own light, for their appearance was like burning coals of fire; they are seraphim, or "burners;" denoting the ardour of their love to God, and fervent zeal in his service. We may learn profitable lessons from subjects we cannot fully enter into or understand. But let us attend to the things which relate to our peace and duty, and leave secret things to the Lord, to whom alone they belong. 15-25 Providence, represented by the wheels, produces changes. Sometimes one spoke of the wheel is uppermost, sometimes another; but the motion of the wheel on its own axletree is regular and steady. We need not despond in adversity; the wheels are turning round and will raise us in due time, while those who presume in prosperity know not how soon they may be cast down. The wheel is near the living creatures; the angels are employed as ministers of God's providence. The spirit of the living creatures was in the wheels; the same wisdom, power, and holiness of God, that guide and govern the angels, by them order all events in this lower world. The wheel had four faces, denoting that the providence of God exerts itself in all parts. Look every way upon the wheel of providence, it has a face toward you. Their appearance and work were as a wheel in the middle of a wheel. The disposals of Providence seem to us dark, perplexed, and unaccountable, yet are all wisely ordered for the best. The motion of these wheels was steady, regular, and constant. They went as the Spirit directed, therefore returned not. We should not have to undo that by repentance which we have done amiss, if we followed the guidance of the Spirit. The rings, or rims of the wheels were so vast, that when put in motion the prophet was afraid to look upon them. The consideration of the height and depth of God's counsel should awe us. They were full of eyes round about. The motions of Providence are all directed by infinite Wisdom. All events are determined by the eyes of the Lord, which are in every place beholding the evil and the good; for there is no such thing as chance or fortune. The firmament above was a crystal, glorious, but terribly so. That which we take to be a dark cloud, is to God clear as crystal, through which he looks upon all the inhabitants of the earth. When the angels had roused a careless world, they let down their wings, that God's voice might be plainly heard. The voice of Providence is to open men's ears to the voice of the word. Sounds on earth should awaken our attention to the voice from heaven; for how shall we escape, if we turn away from Him that speaks from thence. 26-28 The eternal Son, the second Person in the Trinity, who afterwards took the human nature, is here denoted. The first thing observed was a throne. It is a throne of glory, a throne of grace, a throne of triumph, a throne of government, a throne of judgment. It is good news to men, that the throne above the firmament is filled with One who appears, even there, in the likeness of a man. The throne is surrounded with a rainbow, the well-known emblem of the covenant, representing God's mercy and covenanted love to his people. The fire of God's wrath was breaking out against Jerusalem, but bounds should be set to it; he would look upon the bow, and remember the covenant. All the prophet saw was only to prepare him for what he was to hear. When he fell on his face, he heard the voice of One that spake. God delights to teach the humble. Let sinners, then, humble themselves before him. And let believers think upon his glory, that they may be gradually changed into his image by the Spirit of the Lord. He put the wheel of time on their heads to mark their deaths. He must have been angry with the people. Unfortunately, I do not understand anything I just read in this chapter unfortunately. but I pray God give me wisdom. The only part I understand is the part with the throne and the figure of the man. Ezekiel Chapter 1 is now fully translated at haitheory through a series of study slides. The wheels within wheels are the machines used to construct Khufu's Great Pyramid. I believe... Ezekiel wrote exactly what he saw! No Helicopter/No Spacecraft/No Missiles... but exactly what GOD wanted him to see! To LOVE GOD, is to first fear GOD! What's happening here sounds so much like REVELATIONS! ... Does it not? Verse 28: The vision was so awe inspiring and amazing that it caused Ezekiel to fall face down. I think I would have done the same or fainted if I saw such magnificence. Ezekiel sees 4 attack helicopters, the duel wheel type similar to a Kamov KA. The crystal is the windshield. Helicopter wings droop down when at rest. DAS surrounds the aircraft and allows the pilot to see the fire of missiles below his feet as if the floor was not there. This is the same vision as the 4 horsemen and it represents the End of Days War. What Do You Think of Ezekiel 1? Near what river did God call Ezekiel?